Famous in Oregon history was the influential Baptist preacher Joab Powell, also of Linn County. The Powell brothers were not related to Joab. 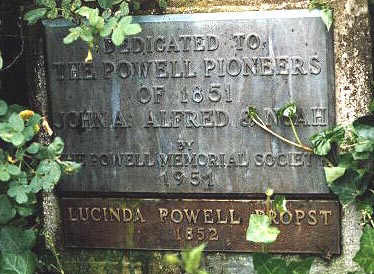 There were other unrelated Powell families that came to Linn County later. In his Journal, John A. Powell consistently spells the Powell name as Powel. However, over the years, the family has adopted the spelling as Powell. We have used this spelling in order to be consistent with contemporary records. 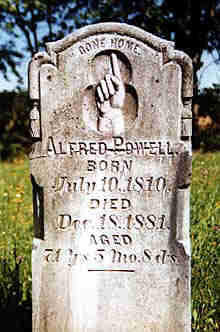 The three Powell brothers were John, Alfred and Noah. Their family history is easily the best documented of any pioneer church leaders. While these pioneer brothers were still in living memory, their heirs compiled and published their recollections. It is from the family's written documents that we draw most of our information for this profile. John's full name was John Alkire Powell with ties to the Stone Movement and the Cane Ridge Revival. For their heritage in a denomination-free, restored church, we recommend the article by Erma Jean Loveland on George Alkire. So, who were these Powell brothers? Three farmers from near Springfield, Illinois who brought their ladies to Linn County with a flair. Our mental pictures may be about those who rode covered wagons to Oregon, but the reality is nearly every overlander walked to Oregon because the wagons and trails were so rough. Better to walk than be jostled seven or eight hours a day for six months. These men brought their wives in carriages and hired single men to bring the wagons. John was a farmer who also preached. His impact on the church in Illinois is documented online in the work of Nathaniel S. Haynes, History of the Disciples in Illinois 1819-1914 where he discusses the Restoration Movement in Menard County. He organized the Athens congregation in 1838 and its membership was more than 200 when Haynes wrote his book. The author describes Powell, "About that time a large, well-formed man, with a powerful voice and dressed in homespun, began to preach there; he spoke just as the Disciples preached on Pentecost and afterward. That was John A. Powell, of Sugar Grove." By the spring of 1851 the farms had been sold, wagons and carriages purchased along with oxen and horses and the group was ready to begin the five months of constant travel to reach Oregon. John Powell had been selected as Captain of the wagon train. They left earlier in the season than most emigrants, April third of 1851. This meant that the animals would have to be fed with supplies until about May first. When they reached Oregon, they learned that a large crowd had gathered to see them off, but they had left before the crowd arrived. Each wagon was pulled by four yoke of oxen, but as the trip progressed, some of the oxen died and were replaced by cows. One of the ladies in the party remembered, "We had our music books and frequently gathered at one camp evenings, and many were the songs we sang." The wagons and the carriages made up two groups, but they combined camps to praise God and acknowledge their total dependence on Him. "Dear Sir: After so long I will try to answer your letter of October 18, 1899, and will proceed with my story. I am now about sixty-eight years old; my memory has failed somewhat, my eyesight very much, and my hand is nervous, but I will do the best I can. Now to my story. The train that I was with was known as Powell's train. It consisted of John A. Powell, Noah Powell, Alfred Powell and George Alkire as the old men of the company. Then there were Wm. McFadden and F. S. Powell, young married men. The young men or larger boys of the train were A. Steuben Powell, J. B. Smith, John Alkire, Wm. Shirl, S. Hamilton and James Henry Powell, teamsters aged about eighteen to twenty years. The old men mentioned all had families. Jemima Powell and Ann Shirl were young women. There were also smaller boys and girls too numerous to mention. "The bachelor train, as I remember it, consisted of the following persons: Joseph Williams, John Davis, James Turner, J. M. Jacks, Jack Engle, Bob Brown, Press and Sam Black, and Bob Estle. "The reasons for leaving Illinois to come West were various. The old men with families came to get cheap land for themselves and their children, as well as a milder climate, better health and better financial conditions. Others were attracted by the gold mines. As for myself, I was an orphan boy, and my home was anywhere that I was treated kindly. I wanted to see the elephants, so came West to grow up with the country. "We started from home in Menard County, Illinois, on the 3rd day of April 1851, reached Havana on the Illinois river April 4th in a snow squall, so laid over a half day, crossed on the fifth, and stopped that night at a farmhouse at the edge of a crab-apple thicket to buy corn, as everything had to be fed until at least the first of May. "I will here say that our outfits each consisted of a good stout wagon and four yokes, or eight head of oxen, except that the old men each had a family carriage drawn by two horses." "About August 1st we camped on Snake River. One very hot day Theresa lay down in her wagon and went to sleep; about 4 p.m. the wind came up very cold and blew on her for some time before she awoke. From this she took a very bad cold and gradually went down, and died August 10 in the Blue Mountains. We were then a long way from civilization. Grandpa took the sideboards from the wagon and made a coffin and used the boards we had for a table for the head and foot of the grave, cutting her name and age on them with his knife. Meecham Station is now near that place. "Here I must digress a little. When we crossed Green River, we had to pay $10.00 a wagon. Each of the old men brought their carriages thus far, but, not wishing to pay the ferriage on them, they left all three of them on the other side. Along here Grandpa was very sick. He began to think that he would never get there; however, he gradually recovered." On our way from Illinois to this Territory, we had the misfortune to loose our eldest daughter. She died in the Blue Mountains, age 22 years and 6 months. She left a husband and two small children. This was the severest trail I ever experienced. To part with a dear child and under such circumstances, far from the abode of civilized man, and even denied the privilege of burial in the usual decent manner, was too much for us to bear right patiently. But we sorrow not as those who have no hope -- she "died in he Lord." Christian Record, December 1852, page 192. So Theresa McFadden made it to Oregon, but died before reaching Linn County. William McFadden soon married a sister to one of the other brothers-in-law. This family group had it better than most of the travelers, but there was one death to mar their entry into Oregon and the new world it opened to them. Three farmer-preachers had arrived in the earthly Eden and heaven would be richer for the seed they would sow and the harvest they would reap. John was the family leader and captain of the two-part wagon train. The single men hired to drive the wagons and oxen were usually behind the carriages with the families. But they rendezvoused in the evenings. They may have kept some distance between them because of the dust that was raised at times. "After coming to Oregon in 1851, before the days of church houses, he preached in groves, barns, school- houses and residences all over Western Oregon. In 1852 he became the first missionary of the Christian Church in Oregon, and traveled horseback the length of the state, establishing churches, and sowing the seed for future religious work. His well-tilled farm and auxiliary enterprises supported him and his family. He never asked for money for his ministerial services, and seldom received any. His heart was with his fellow men, and, eager to lay the foundation of an enduring and stable government, he upheld the golden rule and high ideals of life and admonished people to fear God and keep his commandments. "His favorite time for study was the late evening hours when others were asleep. Josephus' History of the Jews and Rollin's Ancient History were in his large library. "John had a powerful physique; he was six feet in height and weighed two hundred and twenty-five pounds. A man of indomitable will, he knew no task (to be) unsurmountable. He was a man of force and influence, highly esteemed by all who knew him. "His commanding appearance, his strong, clear voice and his logic and magnetism easily enabled him to hold the undivided attention of his audiences for an hour, and often much longer. His ministerial work, with its hundreds of conversions, was reported from time to time in the Christian Standard, then published by J. M. Mathews. "He was of a serious nature and seldom indulged in jest. In contrast to the fiery exhortations of his brother, Alfred, his public discourses were quiet and dignified in style; his manner of speaking was deliberate. His sermons did not call for great demonstrations, but were designed to give men food for serious thought concerning the great issues of life. "Uncle John or Capt. Powell, as he was called, and his wife were known all over the valley for their hospitality and kindness to strangers as well as to friends in their commodious house. "He was one of the early advocates of higher education and was a trustee of Christian College from its beginning until his death. "He built a sawmill on his claim in 1854 and was the principal contributor of material in the building of a spacious church house under the spreading oaks, about half a mile south of his residence. He was pastor of this church and preached the second and fourth Sundays of each month until a few weeks of his death. (His brother, Alfred, filled the pulpit on the first and third Sundays.) The other two Lord's Days were occupied with appointments away from home, requiring his leaving on Saturday and returning Monday. "When he grew old, he sold his farm and moved to Albany, having a house and several lots across the street from his brother Alfred's residence. Finally, broken in health and exhausted by severe illness, he bravely resigned himself, at the age of seventy-three, saying, 'The Lord's will be done.'" "I think the best things we remember of Grandfather was his missionary work among the people in the settlements where there was no preacher. Everywhere I go in the Willamette Valley, I meet people who tell me they have heard my grandfather preach. They were always glad when he came to their house. Many times I have heard him tell about the meetings he held at Mohawk, Halsey, Scio, Pleasant Hill and other places. "My family had the pleasure of living by him at his old home in Linn County. He loved children and often took my sister and me with him when he went to Albany, Sodaville and other places. "On many occasions he entertained visiting preachers and their wives. I remember Prof. T. F. Campbell, Uncle John Rains and others at his home. "He liked to sing. One song he loved was 'Away Down in the Beautiful Valley Where Love Crowns the Meek and the Lowly.' (One sister at Mohawk thought he composed the song in honor of our little valley.) Another of his favorites was 'Tarry With Me, Oh My Savior.' They sang it the day we laid him to rest in the old family burying ground at Central. "I will never forget hearing him and Uncle John preach at Central. (Editor: The Central Church building was at Cottonwood on Highway 20 at that time.) We always got to church first and would watch for the two buggies. They always came together on the Albany road. "Then there came a time when Grandfather stood alone in the pulpit. He could hardly talk he was so lonesome without his brother, John. He kept getting more feeble and it was hard for him to come, but he always came. "The influence of the three brothers, John, Noah and Alfred (Powell) upon the lives of the people in the Willamette Valley can never be summed up until we meet at last at The Great White Throne." "He married Mary Smith in 1830. In April 1851, he and his family started for Oregon with his brothers John and Alfred, arriving in September. He settled in the north end of Howell's Prairie in Marion County. In 1853 he moved into Yamhill County near Amity. During the five years he lived there he preached every Sunday and farmed during the week, doing his best to make a living and educate his family. He moved back into Marion County near the site of the present town of Marion, where he lived until his death. Although he had much to do on his large stock and grain farm, he never neglected his regular trips on horseback to preach at Howell's Prairie and other places, for he was a very devout Christian and a faithful minister of the Church of Christ. In addition to preaching he led the singing, first lining out the song as was the custom in those days owing to the scarcity of hymn books. With his nephew, John Propst, he often went out into the highways and byway in different parts of the country to preach the gospel. Many times the three brothers met at Central Church and took turns in preaching. He passed away on March 8, 1875, and was buried in the Hunsaker Cemetery by the side of his two sons, John and Josiah. His wife was left to spend her remaining days with her three children living, making her home with Lavina Cornelius. 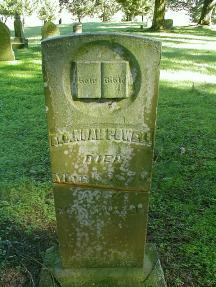 The little-noticed Hunsaker Cemetery on Parrish Gap Road is well kept for a pioneer cemetery and looks across the fields that were daily life of Noah Powell. The three Powell brothers left a remarkable impression on central Oregon, and especially Linn County. Their heirs spread out to many localities, and particularly the area around Cottage Grove. There are Powells embedded in the life of the churches in Oregon. We owe much to these outstanding brothers. To commemorate their contribution to the church, family and State, family and friends erected a monument at the Central Cemetery. Few visit there, but perhaps having a photo of it here will help the family accomplish their goal of memoralizing John, Alfred and Noah Powell.